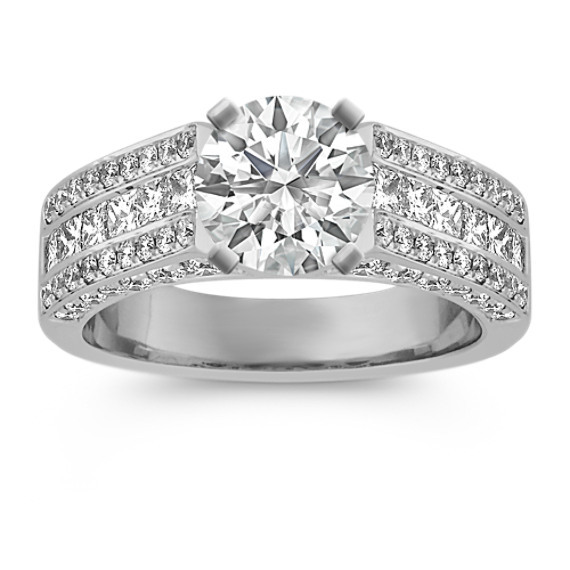 This dazzling 6mm engagement ring features brilliant hand-matched diamonds provide the perfect backdrop to the center diamond of your choice. Twelve princess cut diamonds, at approximately .66 carat TW, serve as brilliant side diamonds. Sixty-four round diamonds, at approximately .69 carat TW, are pavé-set throughout the quality 14 karat white gold band, providing a glamorous, modern look. The total diamond weight is approximately 1.35 carats.